[s.l.] : Thomas Preston, 1744. 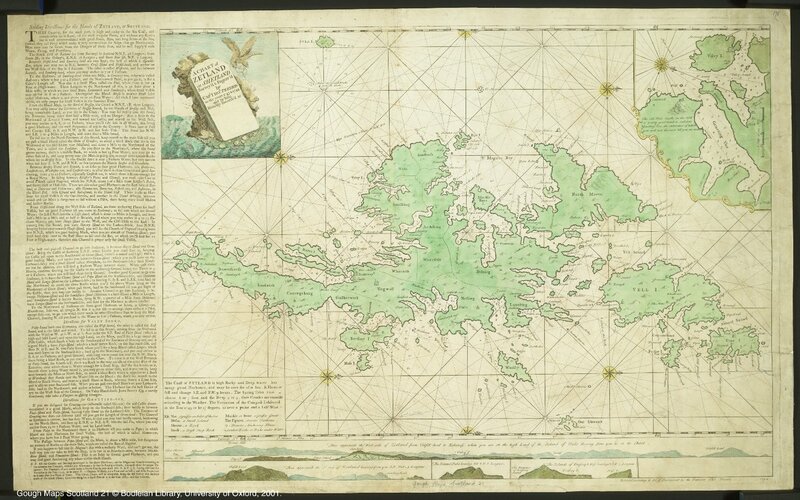 In a letter dated 'Zetland, Jan. 31, 1743-4', Preston writes to Joseph Ames, FRS, that it is 'extremely difficult to make a good chart of the island, of which there is no chart extant worth naming. During my long stay, I have devoted some of my (otherwise) idle time in making observations and surveying the place, by which, and suitable information gained from the inhabitants, I have a sea chart, which I flatter myself may be of great use to other navigators, ...' (T. Gifford, Historical description of the Zetland Islands, Edinburgh: 1879, p.96). Moir, D.G., Early maps of Scotland, 3rd. ed., v.2, 1983, p.14. Gifford, Thomas of Busta, Historical description of the Zetland Islands, Edinburgh, 1879, pp.96-100.